If I were a cabbie, I’d definitely get one of these. But the experience was exceptional even as a passenger. 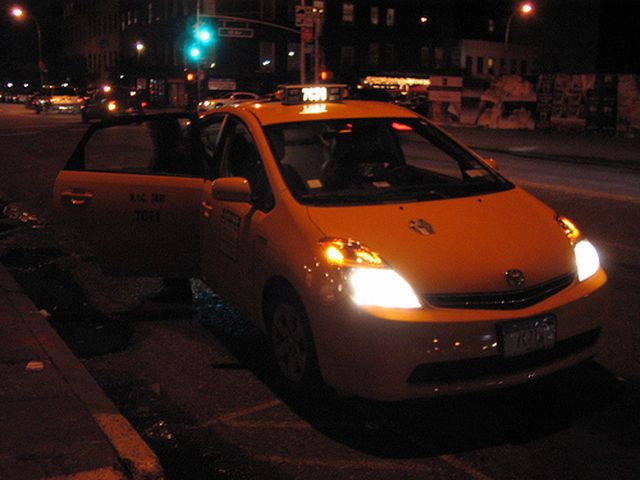 I'm not saying I was totally sober, that's why we were looking for a cab in the first place. Actually, we weren't even sure whether we should hail one, as we were a manageable walking distance away from home, but we had already strolled home twice that week from one bank of the river to the other, and we didn't feel like walking through the tunnel again. I was still put off by the predatory cab drivers in the city, so we decided that if a car of one of the more likeable taxi companies was to cross our way, we'd take it. We don't like taking cabs, what can you do. We were already walking homewards when, accompanied by the strange sound of rushing electrons only those recognize who know what to watch out for, a Prius stopped by. My eyes lit up. God knows I'm not planning on ever getting one, but as a cab there's just no better choice. A cabbie driving a Prius can only be a smart guy. Around midnight, having downed a few glasses of wine the world becomes a simpler place. You're led by sudden impulses. The familiar emblem on the cab made the decision easier anyway. While the passengers about to leave were paying, I said hello through the window and asked if he'd take us. The back seats which we plopped on were still warm. Vroom! The hoarse second generation Prius flared up as we started. The exhaust pipe was tatty. Having a look around inside I concluded the whole car was in fact a tad tatty. Gosh, have we really arrived at a point where the technology of the future is haunting us in a weathered cab? I got a strange feeling. It was like The fifth element mixed with A night on Earth. We were driving in a nearly 10 year-old hybrid which must have done about half a million kilometres. At times the battered exhaust pipe growled under us, then it went quiet for some time and we glided on in silence. It was surreal. 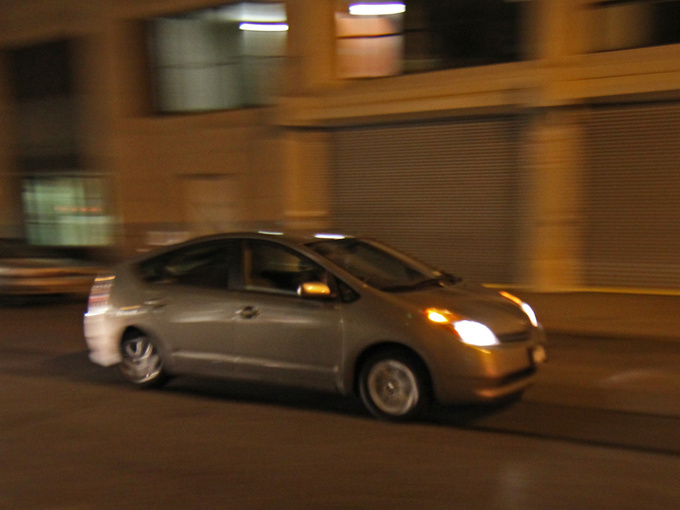 I had taken a ride in a Prius cab before, but that was a brand new, pearl white third generation one in San Francisco, driven by a wimp fumbling with his iPhone on end, refusing to help us with our luggage. That was an odd and sterile futuristic experience, as if we had been transported by an awkwardly programmed beta version robot. This grey second gen in Budapest was different, this was a future painted by scruffy upholstery, greasy door handles, and a tatty exhaust pipe. Our future. Who are you, where did you come from? From the US? 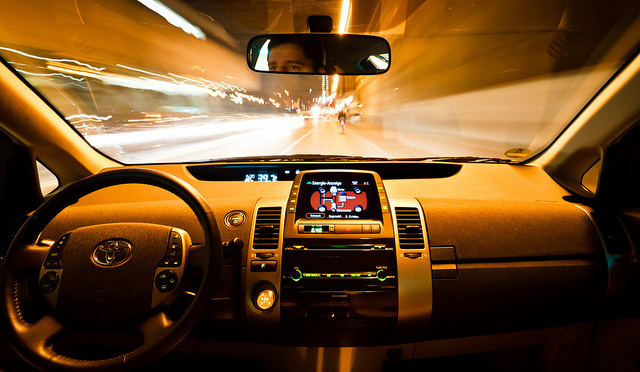 Are you one of those tarted up crashed and dumped cars that arrive in a container? An economizing ex-Californian commuter? A cab driver in Budapest is very unlikely to ever shell out for a new Prius. As the indicator stripe of the coulomb was zigzagging between the symbol of the battery and that of the electric motor on the central display, once intended to be futuristic but looking more like some dated electronic game by now, my eyes wandered off and I spotted a red sticker in the corner of the windscreen. Oops, a Prius running on LPG! I suddenly had even more respect for the driver. Of course! The perfect taxi is not a Prius, but a Prius powered by LPG. I have driven one like this once, but that was a first generation Prius. Since then I've only heard rumours about people warming to hybrids running on LPG. It does require some level of perversion, no doubt about that, but it's perfectly understandable. It's hard to imagine a cheaper way of transportation, and it's a praiseworthy choice from an emission point of view, too. I would rather not get in the car of a cab driver who's got the nerves to complain about the missing driving experience. The Prius has got automatic gearbox, but it never conks out, it gets good mileage, especially running on LPG, and is just the right size. Is everyone nuts, not choosing Priuses as cabs? This is about how far I had come in my head when the engine, making one last rattle, suddenly stopped, and regenerating some kinetic energy we stood still. We had arrived, we paid and got out. For a moment I caught myself lusting for such a thing. But only for a moment. Their prices have become pretty reasonable by now. Driving an LPG powered car would cost me less than a diesel. It's got 5 doors, it's practical. I would be able to sleep with a clear, green conscience. Then again, I wouldn't be able to take the brain death that comes with driving it. It's a lame, lacklustre, stumbling piece of rubbish with a constantly slipping gearbox. I'd only love it for the money. Let them all become cabs instead. 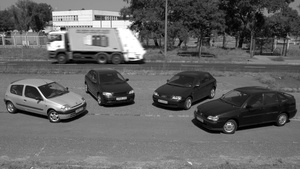 With a budget of 2000 Euros we set out to find a useable car on the second hand market. Of real cars we saw very little but unbelievable horrors cheered up our day.